It turns out, it's VERY hard to make a high pigment lipstick without using heavy metals. For this reason, many cleaner / safer makeup brands only offer sheer lipsticks or glosses. This was true of Beautycounter for its first five years of operation, and when I started wearing BC makeup, I continued to use my department store lipsticks (despite being fully aware of the lead I was swallowing regularly...perhaps not my finest hour). Anyway, I was more than ready to ditch my conventional lipstick arsenal when the BC Color Intense Lipsticks launched at the end of 2017. I found that the pigment and longevity of the Color Intense shades easily matched the brands I had been using, and was surprised at how many of the colors worked with my skin tone. What differentiates Beautycounter's foundation from other brands I've used is its consistency. It's lightweight, and the finish is smooth. I have found it to be a great "canvas" for additional makeup because of how seamlessly it sits on the skin. It contains hyaluronic acid, a naturally occurring acid in the joints, connective tissue, and skin, which works to reduce the appearance of fine lines and wrinkles by repairing and maintaining the natural lipid layer of the skin. When the lipid layer is intact, the skin experiences optimal levels of moisture; not too little and not too much. The coverage is slightly less than what I was getting from my conventional brand, however, it improved the look of my skin enough that I eventually stopped needing such heavy coverage. Over the years I have had a hellava' time trying to find a safer eyeliner that actually works. My experience was one of spending a significant amount of money on a product that appeared convincing, only to find that it started to wear off and smear all over my face within an hour or two. I was skeptical when I first tried Beautycounter's version, but ultimately pleased when I found that it didn't smear, and lasted as long as any conventional eyeliner I had tried. I'll be honest, I never got into eyebrow makeup before using the Beautycounter brow pencil, so I don't have anything to compare it to. That said, my experience with it thus far has been great. The pigment is rich and the consistency allows for an easy application. If you're looking for something akin to Dip Brow, this isn't it. However, it IS a great alternative to a conventional brow pencil. 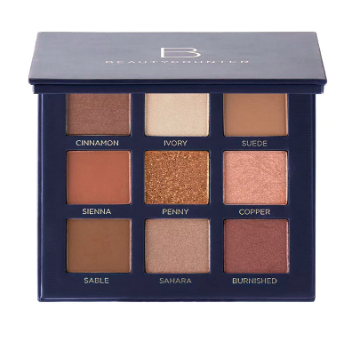 Beautycounter palettes completely changed the way I approach makeup. I was a single eyeshadow girl until I discovered them, but thanks to renowned color theorist and makeup artist Christy Coleman's breakout designs, I now understand how to layer and build color on my eyes to create a much more captivating look. The pigment in the Velvet Eyeshadows is on par with my old department store shades, which is impressive considering it doesn't rely on ingredients with high metal content to achieve its color. The Classic Palette is my favorite but the Romantic Palette is a close second. The cream blush stick was one of the first Beautycounter makeup products I purchased and it did not disappoint. The pigment is rich and it blends easily into the skin. Plus, one stick lasts nearly a year, even with daily use. The abridged version: I trust Beautycounter's extensive testing protocol to deliver the safest product possible, without compromising performance. I deeply support its mission ("to get safer products into the hands of everyone") and appreciate its active role lobbying for better regulation in the beauty industry at large. For years I only used food grade oils and water on my skin. I basically forgot that any other options existed. I started buying Beautycounter makeup before exploring the skincare line, following years of TRYING to use safer makeup brands but inevitably going back to my toxic arsenal when they failed to work well. Then I started hearing rave reviews about the charcoal mask, and decided I needed to find out if it was as life changing as people were claiming it was... I was obsessed from my first application. From that point, my interest in Beautycounter's skincare snowballed to include all of the items listed above. While I had no serious qualms with my face before using Beautycounter's skincare, I didn't realize how good my skin COULD look with a little extra attention. My routine improved my complexion big time, and it wasn't long before I was getting complimented left and right. I declared it a WIN. Beautycounter is a Certified B Corporation, meaning it meets rigorous standards of social and environmental performance, accountability, and transparency. Because the beauty industry is so unregulated, brands are not obligated to screen for heavy metals, or a variety of known harmful contaminants. Beautycounter elects to screen extensively, however, and is transparent about its findings, never claiming perfection, but using the data to continue to refine products to be as safe as possible, while maintaining performance. *Note: When a brand claims they are metal-free, it may be because they have not actually screened for metals and are simply trusting the source of their ingredients. Any clay sourced in the U.S. (used for pressed powders, eye-shadows, blush, etc.) is likely problematic, "organic" or not. Clay from other regions may be lower in metals, but not completely devoid of them. In addition, Beautycounter has banned the use of over 1500 harmful or questionable ingredients in its products, including several known hormone disrupting agents (AKA endocrine disrupters). To put that in perspective... THE UNITED STATES ONLY BANS 30 INGREDIENTS. Not only is Beautycounter stepping up to do a hellava' lot better for us than our government is where beauty safety is concerned, but it uses a portion of every sale to fuel its efforts in Washington to lobby for safer regulations in the beauty industry at large. The company is fighting for a world where women who CAN'T afford to shell out for cleaner / safer beauty products are still protected. That, I can get behind.